The island of Korcula (Korčula), the gem of Adriatic archipelago, is the sixth largest island in the Adriatic Sea. The island with one of the richest vegetation on the Adriatic coast is covered with more than hundred species of scented Mediterranean plants and dense pine forests. In the distant past, this island was named Korkyra Nigra, after numerous pine forests. One of the biggest advantages of Korcula (Korčula) as the tourist destination is purity and clarity of the surrounding sea. Situated relatively near the mainland, the island of Korcula (Korčula) stretches from east to west, unlike most of the Dalmatian islands. The island is rich in art and culture, as well as in beautiful nature, with numerous small uninhabited islets and breath taking sceneries. Countless beautiful beaches and bays, luxurious hotels and holiday homes, centuries-old olive groves and vineyards, ancient villas and ancient island towns, which seems to have remained lost in a long past times, host the tourists from all over the world. Along Korcula's coastline, there are several picturesque places, Korcula (Korčula), Lumbarda and Vela Luka, Zrnovo (Žrnovo), Pupnat, Cara, Smokvica and Blato, in the interior part of the island, hide charm and connections with ancient way of living, closely related to the land on which one of the best varieties of wine and olive oil is cultivated. 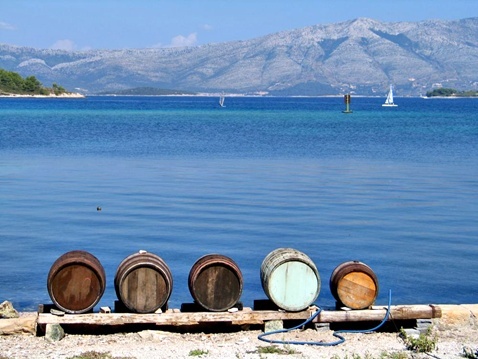 Korcula (Korčula) is also a home of many generations of hard-working people. The city of Korcula (Korčula), historic centre of the island, converges with an exceptionally beautiful location in the Peljeski (Pelješki) channel, as well as the abundance of cultural heritage and tradition of seafaring, shipbuilding, stone-masonry, etc. According to the legend and to some medieval written records, the island of Korčula is the birth place of famous world traveler - Marco Polo. The main richness of the island is its land and sea, as well as hospitable and proud people. Mediterranean way of life can be noted at every step, and the taste of the Mediterranean is a must in the rich tradition of Korčula's cuisine.